Planning a Football Trip to Porto? (Real Sociadad) Free guide – where to stay, eat, drink and how to get tickets; to the stadium. Porto, also known as Oporto, is the second city of Portugal. Located inland on the Douro River estuary, Porto has a rich history that lends it a unique character that attracts visitors from the world over. You can fly to Porto from London, Liverpool, Birmingham, Manchester, Edinburgh and Bristol directly and from Nottingham East Midlands, Newcastle, Belfast, Cardiff and Leeds with one stop for about £100. Flying from the UK, Porto flights take approximately two and a half hours. The Porto airport taxi ride will take approximately 20 minutes into the city and cost around 23€. The average travel time between Lisbon and Porto is 2h50 minutes. The quickest route is 2h35 minutes. The first train leaving Lisbon is at 06:00, the last at 21:39. There is an average of 32trains a day between Lisbon and Porto, leaving approximately every 44 minutes. The metro system is clean, efficient and safe and is the easiest way to get from the airport to the city centre. Unfortunately, it isn’t much use in the hilly historical centre or for getting to Foz. Trams and buses are better for these. Find maps and timetables for Porto’s Metro system on the website. Use the Andante card or Porto Card (see below) to pay for metro journeys. The Andante cards also work on the city’s bus service, which, along with the metro, is integrated with Google Maps so you if you have internet, you can easily find out the best way to get around Porto by public transport. There’s free wifi onboard, too. You can pay the driver if you haven’t managed to get an Andante card sorted out. It costs a bit more but for one or two trips, it could be worth it to save you the hassle of getting a card. 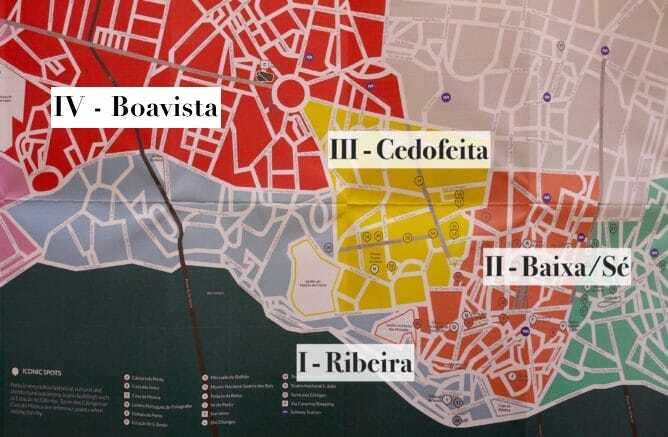 self-guided Porto walking tour if you prefer to be independent and like walking. Designed to take you to the must sees and some lesser known sights. It’s flexible enough that you can take one or two days to complete the route so you can go at your own pace and choose your sights as you see fit. The Estádio do Dragão (Portuguese pronunciation: [(ɨ)ˈʃtaðju ðu ðɾɐˈɣɐ̃w]; Dragon Stadium) is an all-seater football stadium located in Porto, Portugal. It is the current home stadium of FC Porto with a capacity of 50,033, making it the third largest football stadium in Portugal. Designed by Portuguese architect Manuel Salgado, the infrastructure was constructed to replace Porto’s previous ground, the Estádio das Antas, along with becoming one of the host venues for the UEFA Euro 2004 tournament finals. The inauguration took place on 16 November 2003 with a friendly match against Barcelona, setting an attendance record of 52,000 spectators. A UEFA category four stadium, it has held several international club competition and national team matches, receiving some of the Euro 2004 matches, including the opening, as well as being selected to host the upcoming 2019 UEFA Nations League Final and 2020 UEFA Super Cup. Plan your Football Trip to Porto with our full list of fixtures or Check the Liga Portugal Website when planning your football trip to Russia for latest fixture information. Ribeira is a picturesque neighborhood in Porto by the riverside, with tiny houses painted in colourful tones. Ribeira is always packed with people, as it has many souvenir shops, restaurants and bars with a view towards the Douro river. Baixa/Sé is a neighborhood just above Ribeira. At this neighborhood in Porto you’ll find plenty of monuments, such as Mercado do Bolhão (the last traditional market of Porto), São Bento train station and Lello bookshop. Cedofeita is the trendiest neighborhood in Porto as it has an art district at Rua Miguel Bombarda, full of art galleries and concept stores. Church of St Francis – This 18th-century Baroque style church is known for being one of the glitziest sights in Porto (do people still say glitzy?). The intricate Gothic architecture and long history have all culminated in this being recognised as a UNESCO World Heritage site. Dom Luis – Crossing over the Douro River, the Dom Luis I Bridge is one of the most iconic sights in Porto due to its sheer size. Palacio da Bolsa – The former stock exchange of Porto, Palácio da Bolsa building dates back to the 19th century. Porto Cathedral – Porto Cathedral is one of the oldest sights to see in the city and one of its most important. Porto’s national museum is not to be missed by those who are even vaguely interested in the history of Portuguese art. The comprehensive collection here dates from the 16th to the 20th century and features paintings, porcelain and even furniture. Mosteiro da Serra do Pilar not only has one of the best views of the city. It’s also a UNESCO World Heritage site to boot. You can hike up here from the city centre or if you’re feeling lazy take the funicular (see below) to the top. Miradouro Ignez (Rua da Restauração 252) Tucked behind the Jardim do Palácio de Cristal on a deck overlooking Porto’s red-tiled rooftops, this casual bar lets you turn your chair towards the sunlit city as the day’s final rays beam down the Douro River. Capela Incomum (Travessa do Carregal 77) – 19th-century chapel converted into the trendy wine bar. On the ground floor, small tables surround an engraved wooden altar set against blush pink walls, while a cosy upstairs area features additional seating. Pair one of the 70-odd wines on offer with a platter of Portuguese cheeses and cured meats. Bop (R. da Firmeza 575) The bar is lined with a collection of more than 2500 records and patrons are invited to spin a vinyl on one of the communal record players with a set of headphones. They have their own beer and a great selection of wine and coffee. 360º Terrace Lounge (Largo Miguel Bombarda 23) in Porto’s neighbouring city of Gaia, but the short walk over the Dom Luís I bridge is hands-down worth it for the view. Upon entering the modern tiled building (which glows a funky blue at night), zip up the elevator to the rooftop and admire Porto’s stacked cityscape of red, orange and yellow from the comfort of an outdoor lounge. As a bar attached to one of Portugal’s famous port wine cellars, the drinks menu is laden with port cocktails, and a bar menu is offered during the summer months. Bonaparte Downtown (Praça Guilherme Gomes Fernandes 40) Big groups can convene in the smoky haze of Bonaparte Downtown’s spacious rear section, while smaller groups can enjoy pints of Guinness from studded leather booth seats near the entrance. Base (Quisque Jardim) At Base, you can sip beer from a cushioned bench seat or stretch out under an olive tree on the manicured lawn, complete with a front-row view of Porto’s iconic Clérigos Tower. Pausa (Rua de José Falcão, 82) At Pausa you’ll find a great variety of beers (over 40 options), gins and whiskeys, cocktails and some options of both table wines and Port wines. It’s definitely one of the best craft beer pubs in Porto! Letraria Craft Beer Garden (Rua da Alegria, 101) Craft beer garden you’ll find over 50 varieties of craft beer – 30 come in glass or can and 20 tap beers. There is a clear focus on Portuguese craft beers, but you can also find international brand such as the Danish Mikkeller. Cervejaria do Carmo (Praça de Carlos Alberto, 124) It has around 50 different types of craft beers, giving more visibility to craft beers from Porto than to internacional brands. Bear in mind that at Cervejaria do Carmo there are almost no options for people who do not like beer. On the other hand, it has a Happy Hour from 5pm to 7pm – 2 beers for the price of 1! A Cozinha do Manel (Rua do Heroísmo 215). A Cozinha do Manel is one of the most traditional restaurants in Porto. The menu is scrumptious! From the entrées to the desserts everything is delicious! A Capoeira (Esplanada do Castelo 63) – Good portions at affordable prices. Antunes Restaurant (R. do Bonjardim 525) is a traditional Portuguese diner that was inaugurated in 1965. It has always been kept in the same family. Brick Clergios (R. Campo dos Mártires da Pátria 103) Brick Clérigos is one of the city’s communal dining pioneers, rallying everyone around a big wooden table stacked with books, colouring pencils and the odd pot. All the dishes are beautifully prepared, and it is common to share them like in a tapas restaurant! Taberna Santo António (32, R. das Virtudes) 5 euros for the main dish of the day but you have to earn it! It is in a small street where the road is pretty steep but it is beautiful up there. This day there was a veal stew serves with rice, fries and salad (1st picture) or a pork cutlets served with baked potatoes (2nd picture). Portions are generous but it is packed all the time. Get there early (or late!). If there is too much people, the owner will put you on a waiting list while you can drink a cold beer just in front of the restaurant. Café Avenida (Rua do Almada 40) 3,90€ for the dish of the day, hard to beat! It is simple food but so delicious. The waiter spoke a little bit of english but we understood each other pretty quickly. It is near the Lui I bridge. Santa Francesinha (Praça dos Poveiros 72) is a great place to try Francesinha, a sandwich made with bread, ham, linguiça, fresh sausage and steak, covered with melted cheese and a hot thick tomato and beer sauce and served with french fries. It’s the local dish. Restaurante Cana Verde (Rua dos Caldeireiros 121), you’ll have the chance to try most Portuguese dishes: duck rice, roasted octopus, sardines, roasted codfish with a delicious sauce, among others and every single one of them is made with fresh ingredients and authentic flavours.